Hey residents of Prince Edward Island! We at Charlottetown Toyota have quite the announcement to make, and if you're in the market for a spacious, luxurious, and eco-friendly family car, we are speaking directly to you! We are proud to introduce the newly designed 2016 Toyota Highlander Hybrid, because if you thought the Highlander couldn't get any better, it just did. It is, truly, one of the best three-row crossover SUV vehicles on the market today, and because the Hybrid version is now available, you can save gas and reduce your carbon footprint while you're at it! It's no surprise that this is one of the most popular family SUV crossovers, and we will be highlighting some of the distinct features it has to offer. At Charlottetown Toyota in Prince Edward Island, we have all the latest models that Toyota offers, and hope that you to come in so that we can find you and your family the Toyota of your dreams, at a deal that you will not be disappointed with. We look forward to serving you so head on over if you are a resident of the Prince Edward Island area, so head on over to us at Charlottetown Toyota today! The 2016 Toyota Highlander Hybrid is a dependable sidekick for you and your loved ones to take on a range of trips, short or long, and because of its hybrid capabilities, you can expect to save on gas and in turn, money. Toyota's goal as a pioneer in fuel efficiency is to optimize in every way possible, which led to making incredible enhancements across the board. How does the Highlander Hybrid save, you might ask? The transmission and efficient engine Toyota has designed works together to enhance the MPG with the use of Toyota's Hybrid Synergy Drive system which works tirelessly to combine the 3.5-liter V6 engine with its electric motor counterpart to produce a net of 280 hybrid horsepower (an impressive increase of 10 horsepower compared to the gas model). All this power and you still get 27 MPG on the streets and 28 MPG on the highways. Needless to say, the Highlander Hybrid delivers excellent fuel efficiency, with a fuel consumption rating of 8.6/8.5 L/100km. They won the Ultra-Low Emission Vehicle rating so you can feel great about saving money and the environment by going with the Hybrid. If you're a visual type of person or just like to monitor how much your Highlander Hybrid is utilizing the electric power and gas (or both simultaneously) is being used, you can easily do so with the Highlander's integrated energy monitor display system. You can expect the Highlander's impressive performance to be seamlessly smooth, without the compromise of being exceedingly fuel-efficient! The base models also include 2.7-liter four-cylinder that makes it fun to drive your car, you can always count on the Highlander Hybrid to take you wherever you want to go. And there's even more: The Highlander Hybrid also features AWD with Intelligence (AWD-i)! The AWD provides exceptional traction for all sorts of terrain and is all automatic, making it easy for you to just focus on driving and getting where you need to be! How this feature works, is that under normal driving conditions, the Highlander uses front-wheel drive vehicle to save on gas. But when you come across terrain that calls for more traction, the integrated AWD-i system switches into all-wheel drive automatically! It's very convenient for the driver and just overall great for fuel efficiency. Have you laid eyes on this handsomely designed 2016 Highlander Hybrid? If so, you will know that the SUV was meticulously designed to sport an athletic build that features a dynamic front grille that focuses on aiding maximum airflow. Another great feature this SUV has is Toyota's proprietary roof rails have been integrated into the sleek design on the XLE and Limited hybrid models. The roof rails are painted silver on the XLE and chrome trim on the Limited; these were designed to allow for easy storage of your gear and accessories. The 2016 Highlander Hybrid also features the power memory lift gate that is fully adjustable! This is such a useful tool that allows you set how high it goes, which is of paramount importance if there's a maximum clearance to adhere to, with a simple press of a button. You can easily customize your presets to fit your needs. You can also use the "flip-up" rear hatch to grab things without even opening your trunk, or when you have oversized items to load into your car! This car is truly an all-in-one winner of SUVs! Toyota's Hybrid Synergy Drive – a hybrid system that never needs to be plugged in! 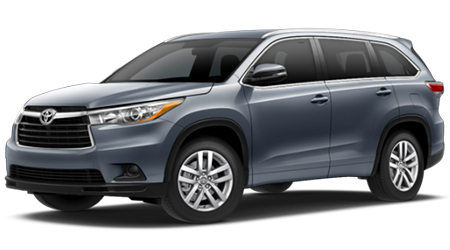 There's no doubt that the 2016 Toyota Highlander is one of Canada's favourite Hybrid crossovers for families. Head on over to Charlottetown Toyota where we make your car-buying experience as awesome as it can be! We have consistently built high rapport with our customers because we value each and every one of them. At Charlottetown Toyota in PEI, we aim to provide the best possible customer service and to help you get into the car that is perfect for your needs. Stop on by at 1 Superior Crescent, Charlottetown, PEI C1A 7L3; we happily serve all residents surrounding PEI! We look forward to seeing you soon!